This is it. The Vikings are set to face the Seahawks in the first round of the NFL playoffs. Join in on the discussion as Andrew Krammer, Judd Zulgad and others react LIVE during the game with #1500ESPNLive. #1500ESPNLive is an experience like no other. You will get instant commentary, opinion, analysis and reaction to what is happening on the field. Enjoy real time videos, photos, audio and posts from around the world via social media.
.@stefon_diggs picks up the first down at the Seattle 27. That was the first sack on Teddy Bridgewater, and we're almost through three quarters. #Vikings on for another field goal. Blair Walsh's "YOU LIKE THAT?" moment. He's 3-for-3 kicking a rock through the uprights today. #Vikings lead 9-0.
.@BlairWalsh3 's 47-yard FG is tied for 3rd longest in #Vikings playoff history and the longest home outdoor playoff FG in #Vikings history. Vikings strategy of letting Blair Walsh score all the points is working so far. Wonder if it has staying power against Seattle. Big #SACK by @cliffavril to force 4th down. MIN adds another #FieldGoal and now it's a 2-score game. NBC has the best FOOTBALL music. Like, their music just SOUND like a football. 2. Adrian Peterson, Russell Wilson, Teddy Bridgewater, Doug Baldwin, any other player: (0). Aren't you happy the Vikings didn't keep Brandon Bostick right now?
. @BlairWalsh3 is 4-for-4 in his playoff career after that 47-yarder. #Vikings lead 9-0 at the start of the 4th quater. #Vikings CB Terence Newman (ankle) is questionable to return. Newman has an ankle injury and his return is questionable. CB Terence Newman (ankle) return is questionable. Rookie Trae Waynes remains in for him. Time for a #Touchdown .. Since merger, teams are 1-43 when shut out through 3 quarters in playoff game (0-2 this postseason). Only win: Falcons vs Eagles,1978. Waynes holding his wrist and calling for a sub. Josh Robinson in. 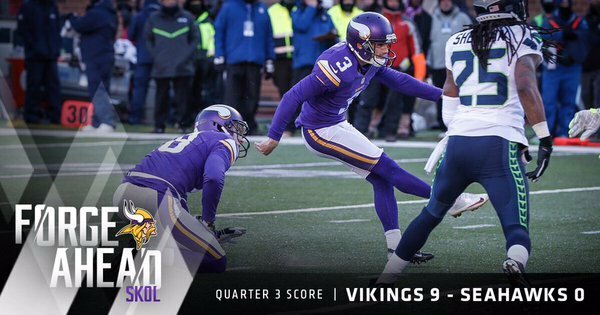 Entering today, Blair Walsh was 12-12 on FG attempts when the weather was 20 degrees or colder. Wilson goes right after Josh Robinson for the TD. 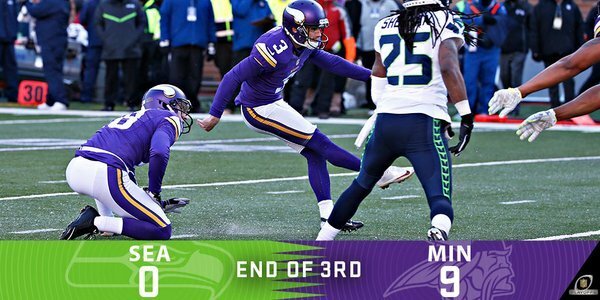 Seahawks cut into #Vikings ' lead. Wilson + Baldwin = #Touchdown ! A Seattle TD cuts the #Vikings lead to 9-7. Wilson targets Josh Robinson. 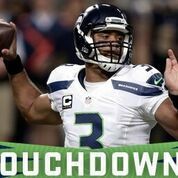 Completes a quick out to Baldwin for Seattle's first score of the game. Set up by that schoolyard football. #Vikings CB Trae Waynes is probable to return with an arm injury.